How do you find your way when it comes to writing? How do you keep your wild tongue? as well as a brief biography of the author where she addresses her writing process and how she struggles to maintain her wild tongue and unique voice and language– how she finds her way out of the box. How does Gloria Anzaldua’s writing process compare to yours? Can you relate to her struggles? Here are 4 discussion questions for Gloria Anzaldúa, “Tlilli, Tlapalli: The Path of the Red and Black Ink” from Borderlands/La Frontera: The New Mestiza. Choose at lease one quote that supports your analysis. 1. What distinctions does Anzaldúa make between how “Western culture think(s) of art works” and how Mexican tribal cultures think of art works? About the life of the artifact, for instance? Or the idea of “virtuosity”? Or the idea of artistic “power”? Or about ethnocentrism, “borrowing,” and the role of art in everyday culture? What statement does Anzaldúa ultimately make about the future of Western culture? What solutions does she propose for the problems that “unchecked, could blow us into acid rain in a fraction of a millisecond”? 2. Is “The Path of the Red and Black Ink” a work of nonfiction or fiction? What, for instance, does the line “I write the myths in me, the myths I am, the myths I want to become” suggest about the work itself? Are there passages in which the genre of “The Path of the Red and Black Ink” seems to change, or in which the author’s relationship to something the reader might call “fact” or “reason” dramatically changes? Using the standards for creativity that Anzaldúa offers, what transformation of consciousness (if any) has occurred in those passages? 3. What is a “Borderland”? Anzaldúa writes, “Being a writer feels very much like being a Chicana, or being queer.” How does the idea of a “Borderland” describe a variety of psychological states, and positions within a society? What makes living in a “Borderland” a “numinous experience,” not a “nightmare”? How is writing–and the author’s relationship to her work–“symptomatic of a larger creative process–cultural shifts . . . cultural ambiguity”? 4. Anzaldúa describes the body as a “crossroads,” creativity as painful “continuous multiple pregnancies,” and her writing desk as an altar composed of ceremonial objects. Overall, what relationship does Anzaldúa construct between Western and tribal cultures? What objects, for instance, can be found on her desk? What is the source of her inspiration? And where (and how) does she find resolution? 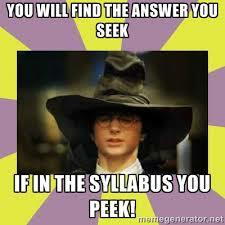 No one except a fellow teacher would really understand what it takes to put together a solid syllabus. 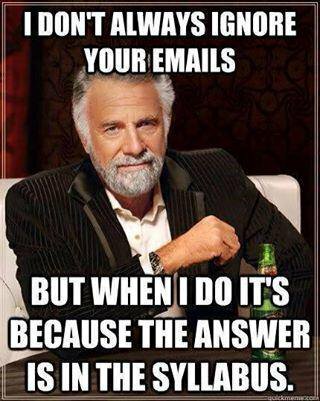 And how frustrating it is when students don’t read it or refer to it. I try to be patient. After all, the class policies part of the syllabus is four pages. 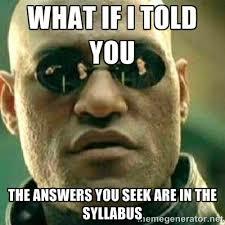 And the syllabus itself is six pages. That’s a lot of information to digest.